How does Excellence in Spelling work? Parents will first watch a 28 minute DVD that describes how the mind works to develop spelling skills and shows parents the "how to" of the Phonetic Zoo. Using the Phonetic Zoo flashcards, present the first rule to your student. Read the rule out loud from the back of the card and have the child read and spell out loud the three words. Discuss how the animal name illustrates the rule of the lesson. Give your child the small zoo card. This card provides both a reminder of the rule and a motivational tool as children collect cards when they progress through the lessons. The child can listen to the introductory comments and the first lesson. Each lesson is less than 10 minutes long. The CD will present each spelling word for the child to spell on paper and will repeat the rule jingle after every third spelling word to secure the rule in the child’s memory. Be sure your child knows how to operate the CD player to pause the lesson if necessary and advance to the appropriate lesson each day. The CD will spell the words for your child at the end of the lesson. Your child may also check them against the rule card if that is helpful to him. You may wish to check it as well. Your child should repeat the lesson each day until he achieves 100% correct twice in a row. This could take anywhere from three to twenty days depending on the child and the lesson, but the average should be around five or six. Every fifth lesson is a Personal Spelling lesson. The flash cards for these lessons have 15 blank spaces. The words for these spaces should be gathered from errors in written compositions as well as vocabulary or other language arts curriculum. Commonly misspelled words can also be presented here. You can either read these words to your student or record them on a cassette tape for the child to listen to independently. The Phonetic Zoo comes in three levels. Generally, A is for 4-5th grades, B is for 6-7th grades, and C is for 8th on up. First time users purchase the Initial Phonetic Zoo program at the appropriate level for your student. When purchasing the next level, choose the Additional Phonetic Zoo program since you already have the DVD and lesson cards. Purchase this package if you already have the introductory video and flashcards. 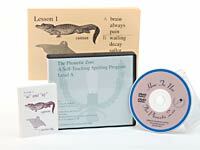 Includes 5 audio CDs, personal spelling list cards, and zoo cards. Choose one level: A, B, or C.
Choose this option if you just want the instructions and spelling lessons but do not wish to use the CDs. 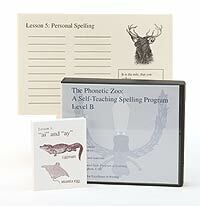 Includes personal spelling flashcards and zoo cards. These are optional if you like using the zoo cards for rewards and want the personal spelling cards to keep track of your student's typical misspellngs for the personal spelling lesson. Humans learn best by seeing, hearing, or feeling things that are either very frequent, very intense, or very long-lasting. There is no other way. Spelling is the correct retrieval of sequentially stored, virtually random bits of information. To spell well, students need to correctly retrieve that information. Students vary in their learning styles. A child who is visual will be more able to learn from textbooks and worksheets. Some are more auditory, learning best from hearing the rules and words. A kinesthetic child will want to feel and move, anchoring information to the brain through the body. Unfortunately, textbooks and worksheets are exclusively visual and often do not provide the most efficient method of study. When we look at a word we see it as a whole. But spelling is sequential, and the correct sequence can be missed when seen as a whole. Spelling the word out loud, letter by letter, ensures accurate storage of the correct sequence in the brain. Hence, auditory input is the best possible way to store spelling information accurately. All children learn best when what they see is reinforced by hearing and when what they hear is reinforced by what is by seeing. Thus the "blending of sound and sight" is the most effective educational approach to language arts study. The Phonetic Zoo combines phonetic spelling rules with the theme of animals and a zoo to illustrate the spelling rules. The Phonetic Zoo comes in three levels. Each level uses the same spelling rules but with more difficult words presented at the upper levels. You can view the placement test if you are unsure what level would be best for your child.